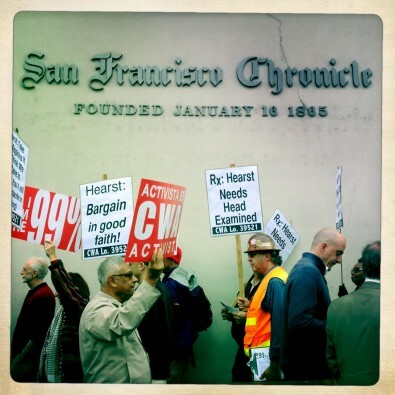 Chronicle workers rally for a fair contract from Hearst. Photo by Mike Kepka/Chronicle unit 2012. Hearst Corp. offered its first significant move toward settling the San Francisco Chronicle Guild contract today, proposing a four-year deal that would nudge pay higher each year while dramatically changing how our health benefits are provided. The management’s proposal included a 1.5% pay increase in each of the next four years. The health care system would be the same for the Guild as for management staff, starting at the end of 2013. Until then, Guild health care would remain about as it is now. In 2014, coverage options would still include Kaiser HMO, but the Health Net HMO and PPO would drop away to be replaced by Cigna PPO and other new options. Costs in most cases would rise significantly for similar benefits. The Guild bargaining committee tentatively rejected a different plan the company outlined, built around a package of Kaiser “high-deductible” health plans. The benefits appeared to be inferior to those of the management system. We also demanded pay raises high enough – at least 3 percent in each of the four years – to make up for the anticipated jump in health premiums most of our members would bear under the new Hearst proposal. For example, a typical Chronicle photographer or reporter, paid the Schedule A top minimum, would have to take a $71 a month cut in pay to cover the cost of single Kaiser coverage, even after receiving the company’s proposed pay increase. No agreements were reached Friday. The company said it will prepare a more detailed proposal for the next round of talks, scheduled Nov. 15. The move into the management health system would end the Media Workers Health & Welfare Trust at the end of 2013. The union-administered trust fund has provided benefits to Chronicle Guild members and others since 1964. Hearst proposes to take over administration of benefits, out of its Charlotte benefits office. The Guild is seeking transition terms and protections against runaway costs and benefit cuts. Guild Bargaining Team: Carl Hall, Michael Cabanatuan, Jon Ferguson, Autumn Grace, Matthai Kuruvila and Kat Anderson. Chronicle Bargaining Team: Carolene Eaddy, Aryn Sobo, Peter Rahbar, Cathy Rommelfanger, and Suzy Cain. High profile labor action sends message to Hearst: Fair contract now!